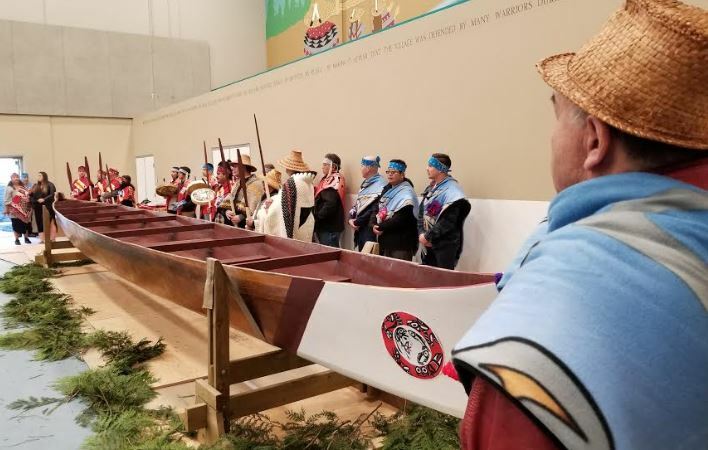 The Kwikwetlem First Nation (KFN) today presented the Province of BC with an ocean-going canoe to be permanently displayed at the həy̓ χwət kwθə šxwhəliʔ leləm (The Healing Spirit House) at the Riverview Lands known by the Kwikwetlem people as,’səmiq̓ wəʔelə Place of the Great Blue Heron’ in Coquitlam. The special ceremony was attended by Kwikwetlem First Nation members, Council and included a dedication from Chief Ron Giesbrecht. The dedication of a KFN canoe for display at The Healing Spirit House is the third time in recent years that KFN has partnered with the Province of BC to ensure Coast Salish art is featured in public areas on its territory. In November 2016, KFN provided art for display in the Coquitlam Central Station on the Evergreen Extension of the Skytrain system. Last month, KFNE announced that all new Electrical Utility Boxes on the Riverview Lands had been wrapped in Coast Salish designs chosen by two KFN Youth, Fred Hulbert Jr. and Austin Joe.